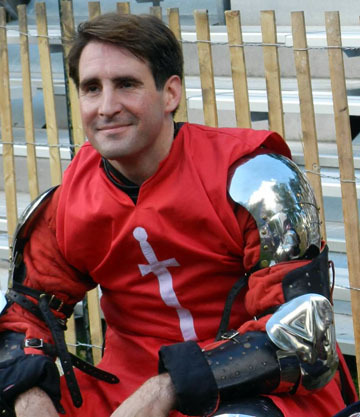 These three men are the first members of NYC's team to try out for America's international medieval combat competition team. Zorikh Lequidre (aka "Captain Zorikh") is the veteran of the team. He was a member of Team USA at the Battle of the Nations in 2012 and 2013, proving his toughness and giant heart that belies his slender frame. At 6'4" tall, he towers over most men on the field. For the second year in a row he will be captain of the "All-on-All" team of USA Knights. Ever a source of optimism and creativity, Zorikh frequently gives the impression of not taking life too seriously. But when he steeps into the gym to train, or onto the field to fight, it is all business. "It's just a mater of priorities," he says. "wherever you are, you have to keep in mind what is important to you when you are considering what you are facing." Born and raised in Manhattan and a resident of Brooklyn for the past 20 years, Zorikh has seen a lot of growth and changes in New York City over the years. He is proud to be representing the City that Never Sleeps and promises a performance worthy of the Big Apple. Zorikh has a skill set and resume as diverse as the population of his native city. 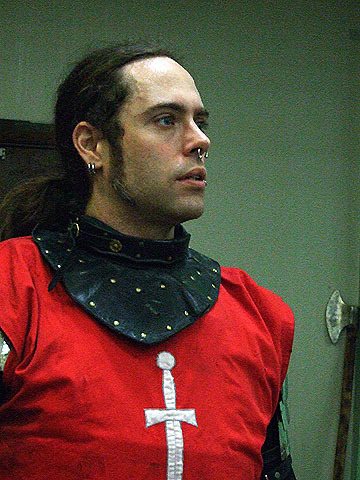 He has spent over 25 year in the Society for Creative Anachronism, and has also studied Brazilian jiu jitsu for several years. He has a degree in illustration and cartooning from the School of Visual Arts in NYC and holds an insurance agent's license. He has worked as a stockbroker and managed comic book conventions. He has appeared in the TV series "Sci-Fi Science" with Dr. Michio Kaku and in the Star Wars fandom documentary "Jedi Junkies" as well as many off-Broadway plays. 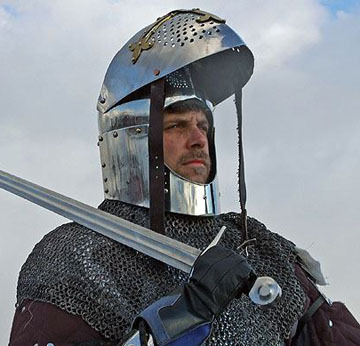 He has produced documentaries about the SCA and the Battle of the Nations, and manages several YouTube channels, including one for the New York Knights. Damion DiGrazia lives, works, and was born in Manhattan. He practices Krav Maga (an Israeli military martial art) and runs 100-mile ultramarathon races. He holds an undergraduate degree from Columbia University and a master’s degree from Harvard University. In the past he’s worked for companies and organizations such as the United Nations, Bloomberg L.P., several investment banks and private equity firms, and is a veteran of the United States Air Force. His concern for his community is reflected in his many civic and charitable activities which include: being an ordained and installed Elder of the Presbytery, Sunday school teacher, American Red Cross disaster responder, volunteer GED teacher, and holds an elected/appointed city official position called “Committeeman.” His non-stop energy, agility, and fighting technique has earned him attention and praise among his teammates; and in his first year in the Armored Combat League he has landed a spot on USA 2, the "Lionhearts," one of the 5-on-5 teams, which is a particularly great honor. Sam Awry lives in Brooklyn where he bartends. He is a student at Columbia University, majoring in medieval history. He spent much of his life touring the country in heavy metal bands but now is devoting himself to armored combat. He studied Washin-Ryu Karate-do with Heidi Ochai and is currently studying aki-jujutsu at Brooklyn Bu-Jutsu-Kai under Sensai Rodreguez. His energy and enthusiasm is inspiring and infectious. he will be fighting on the "All-on-All" team this year in Spain.